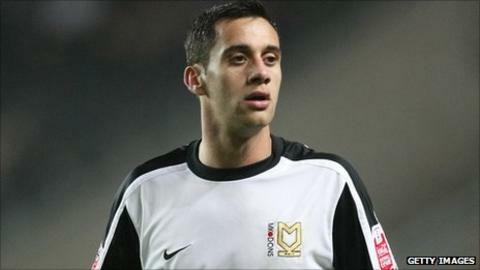 Striker Sam Baldock has joined West Ham from MK Dons for an undisclosed fee. The 22-year-old forward passed a medical at Upton Park on Friday afternoon and agreed a four-year deal, with an option for a further 12 months. Because of the upcoming international break, he is likely to make his debut at home to Portsmouth on 10 September. "I am pleased to be here. I am just excited to be coming to such a great club," Baldock said. "The fans are so passionate and I just want to hit the ground running. "I want to show what I can do for them and hopefully everyone will be proud of me." Baldock, who will wear the number seven shirt for the Hammers, joined League One side MK Dons as a trainee in 2004, making his debut as a 16-year-old against Colchester on 20 December 2005. He has since gone on to appear in the Johnstone's Paint Trophy final against Grimsby at Wembley in March 2008, and also helped the club win the League Two title. This season he has netted six goals in six appearances, including a hat-trick in a 6-2 victory over Chesterfield, and the second in a 4-0 Carling Cup win over Premier League side Norwich on Tuesday. Baldock becomes West Ham's seventh summer signing, and manager Sam Allardyce has previously hinted that there could be more new arrivals at the club before the transfer window shuts on Wednesday night.